On Wednesday, just 5 percent of Puerto Rico had electricity and only 50 percent had water. That information was readily available on the FEMA website as late as Wednesday night. But now it’s gone, while more positive information, like statistics about the percentage of hospitals open (92 percent) and the percentage of grocery stores open (65 percent), are still being made available. The internet archiving tool The Wayback Machine gives us a look at precisely what was deleted. As you can see from an October 3rd snapshot, there’s information about water availability, among other things, under the header “Water/Wastewater Impacts.” But today, that section was scrubbed to include just one statistic: the percentage of waste water treatments that are functioning (64 percent). The same is true of information about power restoration in Puerto Rico. On October 3rd the website showed statistics like the percentage of people with power on the island. That information has been deleted. Positive statistics about the number of federal staff (14,000) and FEMA personnel (800) on the ground are still available on the website, though it obviously doesn’t mention that it took over a week after Hurricane Marla made landfall for those people to arrive. More information about the airports being open (100 percent) and the miles of roadway cleared thus far (20 miles) are also prominently featured. Earlier this week the FEMA site used to have an infographic about the recovery efforts, but that image has been replaced by a photo of helicopters delivering relief supplies and another of a Puerto Rican resident hugging a soldier. 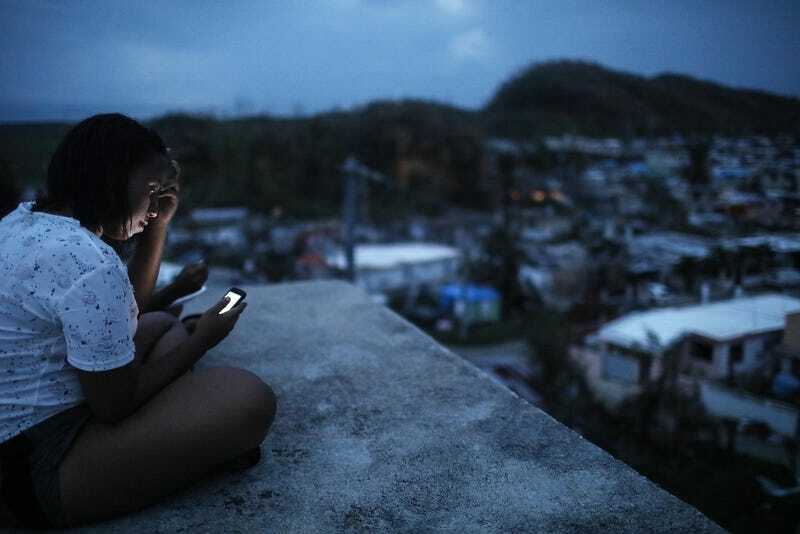 A FEMA spokesperson told the Washington Post that the information which has been scrubbed is still available in Spanish on a website maintained by the Puerto Rican Governor Ricardo Rosselló at www.status.pr. But FEMA had no explanation for why the federal agency was deleting information from its own site that made it look bad. Both FEMA and President Trump have come under fire for their inadequate response to the disaster in Puerto Rico. When the president visited the island earlier this week he seemed most concerned with how he was being perceived in the news media, rather than in efficiently delivering aid. Trump even joked with the storm-ravaged people that he was spending too much money on them. President Trump also said that the hurricane in Puerto Rico wasn’t a “real catastrophe” like Hurricane Katrina, an obvious fear that his response to Puerto Rico is being compared to President George W. Bush’s horrible response to Hurricane Katrina in 2005. “If you look at the... every death is a horror, but if you look at a real catastrophe like Katrina and you look at the tremendous hundreds and hundreds of people that died and what happened here with a storm that was just totally overbearing. No one has ever seen anything like that. What is your death count?” he said. “Sixteen,” said Governor Ricardo Rosselló. The information might be “readily available.” Just not from anyone in the federal government anymore.